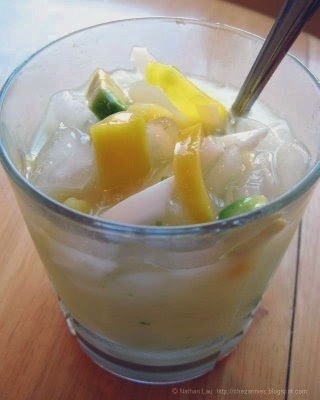 Es Teler (Mixed Fruit Drink) was originaly invented in Indonesia. This cold dessert can be "so-called" the trademark for most of the Indonesian Restaurants and Food-Stalls. It has a sweet and fruity taste with chunks of jackfruits, avacados and young coconut pulp! The coconut juice combination will cool you down from the heat especially when this drink is consume during hot day under the sun! Note: This dessert can be sweetened to taste, adding more, or less, of the milk mixture and the syrups. Add young coconut pulp, avocado, jackfruit and atap-chee in an ice cream glass or in a bowl. Add in simple syrup and sweetened condensed milk or according to your taste. Stir. this is exactly what i’m looking for. tx for the recipe. gonna try this recipe for real.